Jason De León addresses the audience. "I want you to imagine a desert, 102°. You find an object, and there is a story." 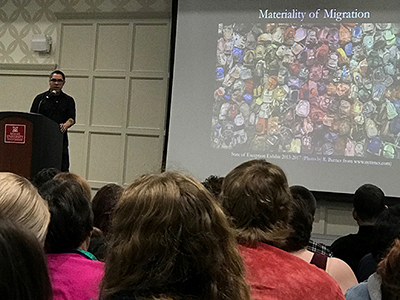 De León, who is an associate professor of anthropology at the University of Michigan, divided his lecture into several key ideas, including the federal border policy of "prevention through deterrence," the anthropological method of taphonomy, and stories of migrant death in Arizona's Sonoran Desert. Referring to the U.S. government's policy of refusing entry (and often arresting) those who attempt to cross into the U.S., De León emphasized his core theme: deterrence kills, and it does not prevent asylum-seekers from crossing the border. He cited statistics claiming that over 6,000 bodies have been recovered since the late 1990s, with rising numbers of fatalities across Arizona and Texas. Basing his lecture on his fieldwork with individuals who have tried to cross the U.S.-Mexico border, De León first focused on the spectre of death among migrants in Nogales, Mexico. "As an observer, you see suffering, but you become accustomed to it," he said. To illustrate this, he told the story of a dead migrant body found outside the Juan Bosco migrant shelter in Nogales. The body drew a crowd, who soon covered it with a blanket — not to conceal the body from other onlookers, but from scavenging animals. A large audience atttended Dr. De León's lecture. For De León, the most striking aspect of this event was when he asked locals about the body the next day. Some looked at him like he was crazy; it had already been forgotten. Migrant death has become normalized in the borderlands, he explained, and people have become desensitized to the presence of dead bodies in their midst. As an anthropologist, De Leon has studied the phenomenon of migrant death in the borderlands from multiple angles: participant observation in migrant shelters, interviews with migrants before and after crossing, asking migrants to take pictures of their journey, forensic analysis of decomposition in the desert, tours of U.S. Border Police facilities, and archaeological analysis of the material culture left in the desert. As he reflected on these methods, De León lingered on the physical difficulty of the crossing experience, which he described as "Walking through great fires, walking directly through flames." Such imagery refers to the stark landscape that creates a natural wall between Mexico and the United States. He also detailed how diverse the Sonoran environment is with mountains, deserts, lakes, rivers, and valleys that not only form a natural barrier but also function as a landscape weaponized by the U.S. government. "The terrain itself wreaks havoc on human bodies during the 7- to 10-day journey," De León said. Furthermore, he added that migrants do not have the benefit of maps, compasses, flashlights, or GPS devices. They have to rely on the stars and their memory of previous journeys to attempt the border crossing. "Most of my classes talk about a 'wall,'" said sophomore international studies major Madelyn Harvey, who attended the event. "[They] do not focus on the journey of crossing the border, personal testimonies, or face-to-face stories, so that was a cool takeaway from this lecture. "Dr. De León is really doing innovative anthropological work, modeling scholarship that is both rigorous and socially engaged," said James Bielo, assistant professor of anthropology, who taught De León's book in his ATH 358 course [Travelers, Migrants, and Refugees: Transnational Migration and Diasporic Communities] this semester. "We were fortunate to have him join our intellectual community for a day, and I'm certain our students benefited greatly. 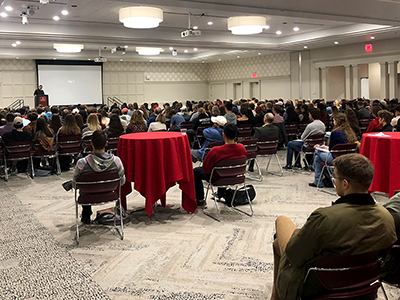 One student went so far as to say that he did not fully appreciate the book until he heard Dr. De León speak and could sense the intensity of his investment in this scholarship."